The next Battlefield 1 DLC pack, Turning Tides, is going to be released in waves, coming next month and during January. Today, DICE confirmed precisely when the first wave of new content will be released. The new Battlefield 1 content will be released on December 11th for Premium Pass owners, with the DLC becoming available to all two weeks later. It will include new maps, a new Operation and a new Elite Class and more. Battlefield 1 Turning Tides will be released in two waves – the first coming on December 11 for Battlefield 1 Premium Pass owners. This content drop will let you fight across a duo of epic maps: Cape Helles and Achi Baba. In a new Operation set on these maps, you can take part in the 1915 British amphibious assault of the Gallipoli peninsula. 6 weapons and 2 melee weapons will be added to your arsenal, and you’ll get to rule the waves with the L-Class Destroyer. There’s more coming after your December battles – you’ll be tackling the North Sea in January. The second wave of Turning Tides content will be released, as already mentioned, sometime during January. Coming January 2018, the second wave deploys you into the North Sea to tackle two other unique maps: Zeebrugge and Heligoland Blight. You’ll also get to charge into battle with the new Royal Marines and spawn on the C-Class Airship to deliver death from above. 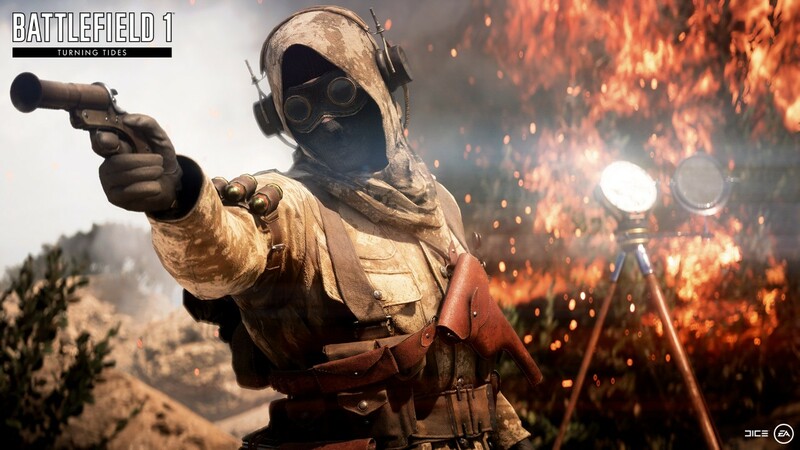 Battlefield 1 is now available on PC, PlaytStation 4 and Xbox One. The Turning Tides DLC first wave of content will launch next month.